DC vs SRH Head-to-Head Record: Ahead of IPL 2019 Clash, Here Are Match Results of Last 5 Delhi Capitals vs Sunrisers Hyderabad Encounters! Delhi Capitals (DC) lower order woes in VIVO Indian Premier League (IPL) 2019 is growing to a level where the team management might have to reshuffle the pack. With cricket being played at such high standards, it is almost criminal to lose games Delhi have done in the league so far in the IPL 2019. They are currently fifth in the IPL 12 points table and tea, standings and take on third-placed Sunrisers Hyderabad (SRH) who could go top of the table by the end of their clash with a win considering their superior net run rate remains intact. Coming to DC vs SRH head to head record, Delhi have a poor record against Hyderabad. The two teams have played each other 12 times with Hyderabad winning eight while Delhi have four wins in their kitty. The visitors clearly have the edge winning twice the number of games Delhi have managed. A quick look at how things turned out in their last five encounters. 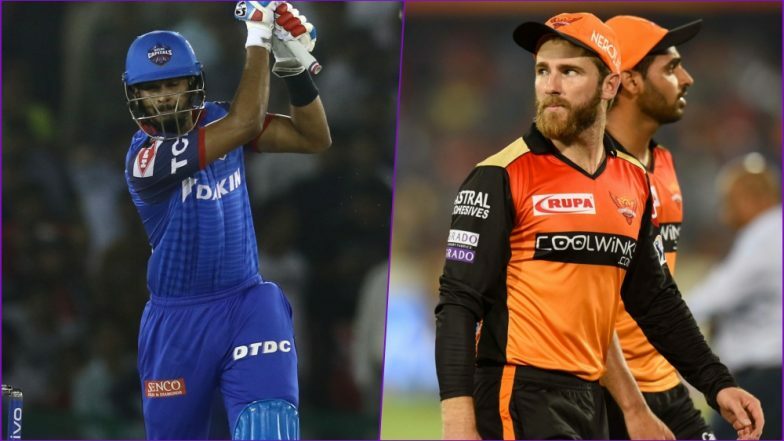 DC vs SRH, IPL 2019 Match 16 Preview: In-Form Sunrisers Hyderabad Hold Edge Against Erratic Delhi Capitals. Risabh Pant hit a brilliant 128 doing the bulk of the scoring for his team as they managed 187/5 in their quota of twenty overs. They could have managed more had there been a more fruitful contribution from the frontline batsmen. In reply, Shikhar Dhawan remained not on 92 and had skipper Kane Williamson for the company at the other end on 83 as the duo took SRH home. DC Batsman Prithvi Shaw Shares His Thoughts Ahead of Delhi Capitals vs Sunrisers Hyderabad, Indian Premier League 2019 (Watch Video). Another win for Sunrisers Hyderabad in a chase against Delhi but this time it was the collective effort from the top five batsmen. Needing 164 for a win, Alex Hales top-scored for SRH with 45 but there were important contributions from Dhawan, Williamson and Yusuf Pathan too. Earlier Rashid Khan picked a brace for the hosts to restrict Delhi to 163. Hyderabad batting fist needed some acceleration in the end from Yuvraj Singh who hit a 41 ball 70 to finish at 185/3. But their bowlers did not do enough to defend this total which can be considered a par score in Delhi. Corey Anderson remained not out on 41 to see off the Hyderabad resistance as Delhi won by 6 wickets. Shikhar Dhawan and Kane Williamson like batting with each other and their 136-run stand against Delhi put them in the driver’s seat. A target of 192 for Delhi was always going to be difficult, but they started well with Sanju Samson hitting a 42. After his wicket, they lost momentum, and Shreyas Iyer’s fifty proved to be futile as they slumped to a 15-run loss. The Sunrisers Hyderabad’s batting was hit by three run outs in their innings that halted their progress. Although David Warner played well for his 73, there was no stepping up from Hyderabad which is needed in T20 cricket to post a high score. Delhi had a largely untroubled chase with Karun Nair leading the charge with 83. Delhi Capitals need to chalk out a plan to get Warner and Bairstow out as the rest of the Hyderabad batting has been relatively untested. If they are successful in doing so, we may have a very good game on our hands.